Just as foods go in and out of fashion (I’m looking at you, kale chips) where and how we dine has also been subject to change. After working on many projects transforming formerly closed off dining rooms into open concept main floors, it’s a fair question to ask. After all, where did the formal dining room come from? Slaves served food to the royal family and guests in the great hall, in medieval times. The host family sat at a raised table while everyone else sat in rows below. In fact, where you were seated signified your value to the family. The further away, the more dispensable you were. A strict affair, you had no choice but to behave and follow protocol or you were removed, permanently. Enjoy your meal! We showed a little more diplomacy in the 20th century. No more raised, massive head tables, the nuclear family now sat at a scaled down, square, round or rectangle table. 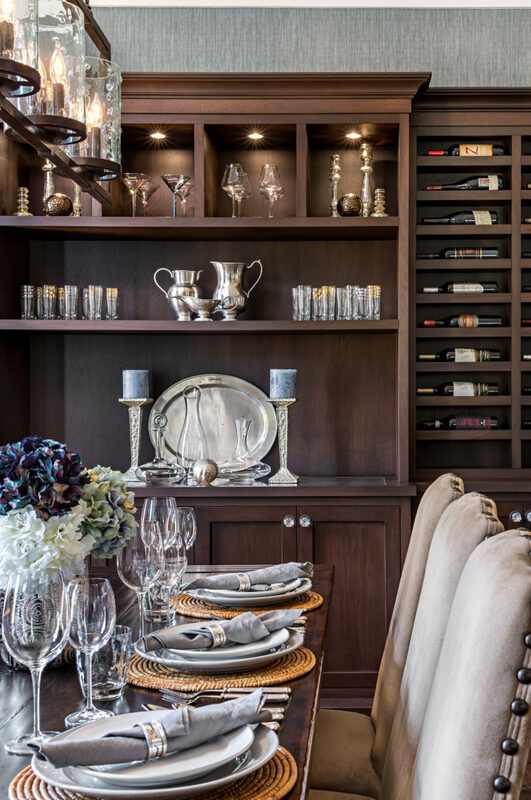 In the suburbs and city alike, family and friends ate together in a coordinated dining suite. Manufactured to match, the glassed-in china cabinet, buffet or sideboard, table, and chairs constituted the average formal dining room, for the good part of the century. Built-ins, a modern complement to the dining room make the space more casual, less stuffy. Where did the formal dining room go? So, what happened? Distractions like radios, TVs, commuting, busy lives, almost everything seemed to take attention away from the eating together, conversing… and making eye contact. With fewer diners at home at the same time, the dinner table became a symbol of neglect. Technology helped make mealtime, any time. Fast food, microwaves, technology in general, all made it easier to cook almost anything at any time, to accommodate our various schedules and desires. The dining room table became a desk, a sorting table for laundry, almost anything but a place to dine. Every holiday or special occasion meant clearing off the debris on the table, dusting off the fine china, only to see it go back into disuse after the meal was over. No matching china cupboard and buffet, just plenty of room and eye-popping ceiling detail! Today, while many of us embrace the airiness of open-concept living, surprisingly, many renovations still include plans for a dining room along with the open concept plan. Thankfully, our furnishings and decor aren’t as rigidly dictated and we’re not as inclined to incorporate a suite for dining as we once were. Still, something has changed, it’s the word, formal. Also gone? Take a look at any used furniture sales site and you’ll see those once-treasured dining room furniture suites for sale. We don’t want our ancestors’ dining furniture but we do want that dining experience. We still love to sit and eat together, throw dinner parties, enjoy food, but we’ve loosened up. 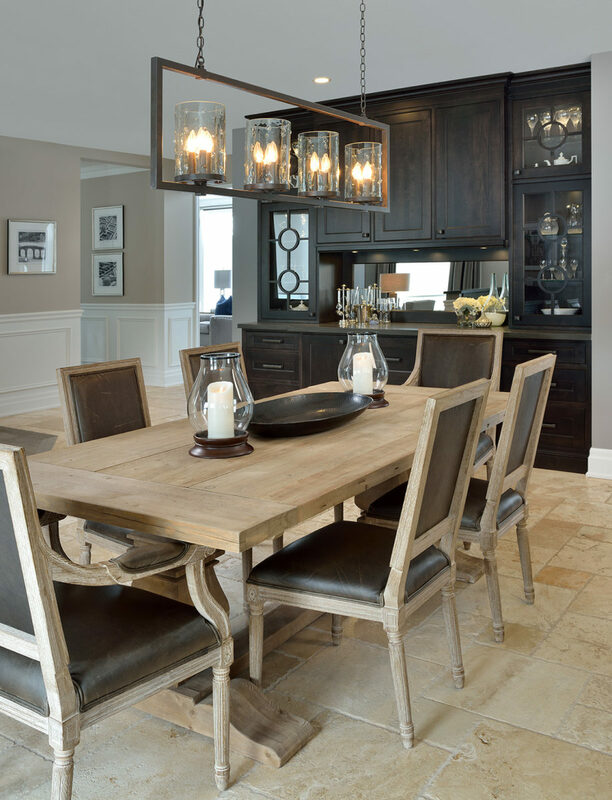 The open concept kitchen includes “unmatched” dining furniture that works together, beautifully. As trends cycle through our lives, people start to feel nostalgic, like missing the family meal when everyone sat together to eat and catch up. I have a feeling the concept of sitting at a table together, eating is making a comeback. Families are making an effort to take a break from the 24-hour news cycle and the distractions from ever-imposing technology to embrace dinner together again. The dining table, recently a symbol for a breakdown in communications, will become known as the place to share a meal and converse, even make eye contact, again. Whether it is in a separate room in the house or part of an open plan, the dining room is alive and well. Maybe you can throw a dinner party just to let everyone know. If you think it’s time to loosen up your dining room, contact us!